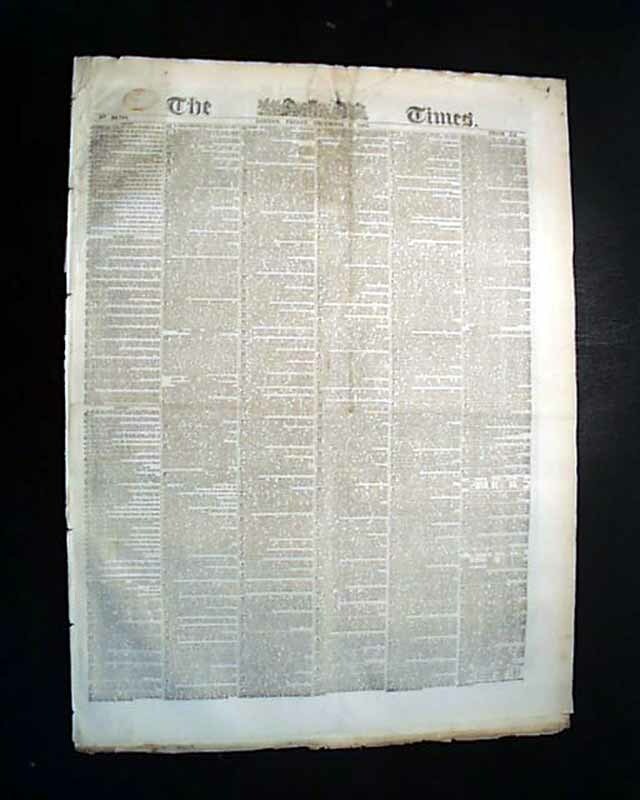 THE TIMES, London, England, Dec. 4, 1863 The top of page 6 has a report headed: "The Field Of Gettysburg" which begins: "The great soldiers' cemetery on the field of Gettysburg was dedicated on the 16th [sic] ult. amid much military pomp. 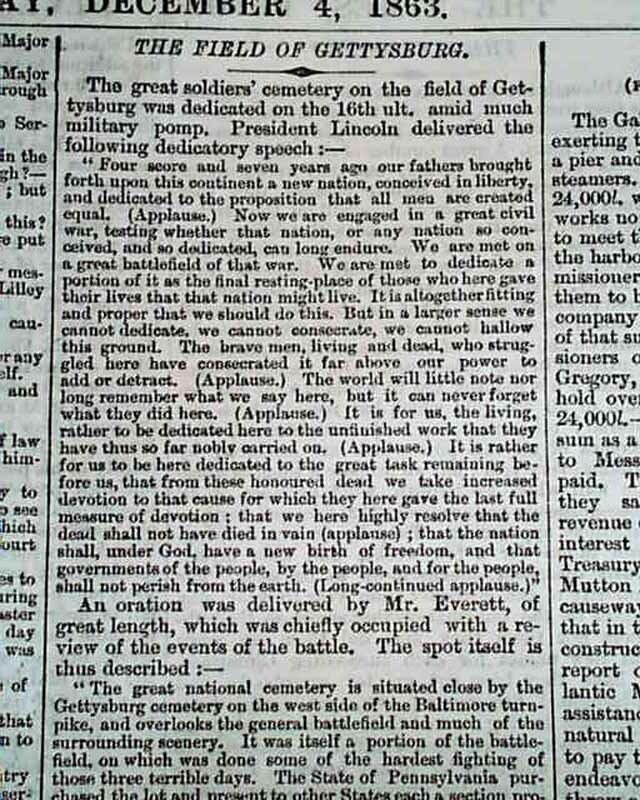 President Lincoln delivered the following dedicatory speech:. 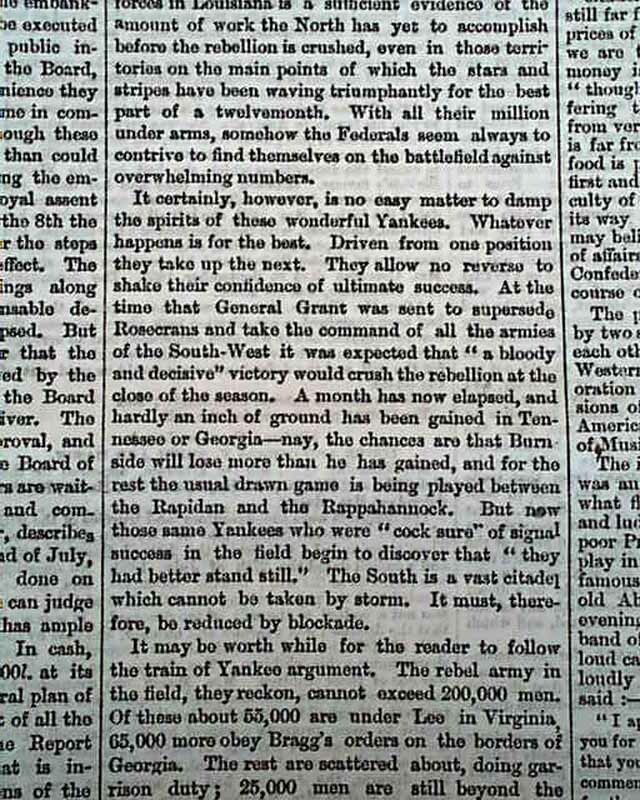 Four score and seven years ago our fathers brought forth upon this continent a new nation..." with the remainder of perhaps the most memorable speech of the 19th century, now known as the Gettysburg Address. 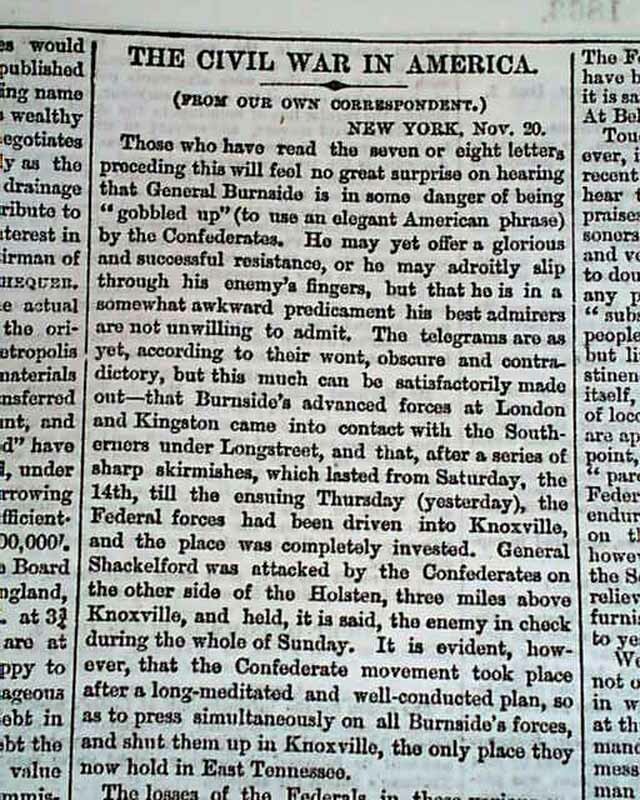 Not only is the text included in full, but there are commentary notes: "applause" a few times where it occurred, and ending with: "(Long continued applause.)" 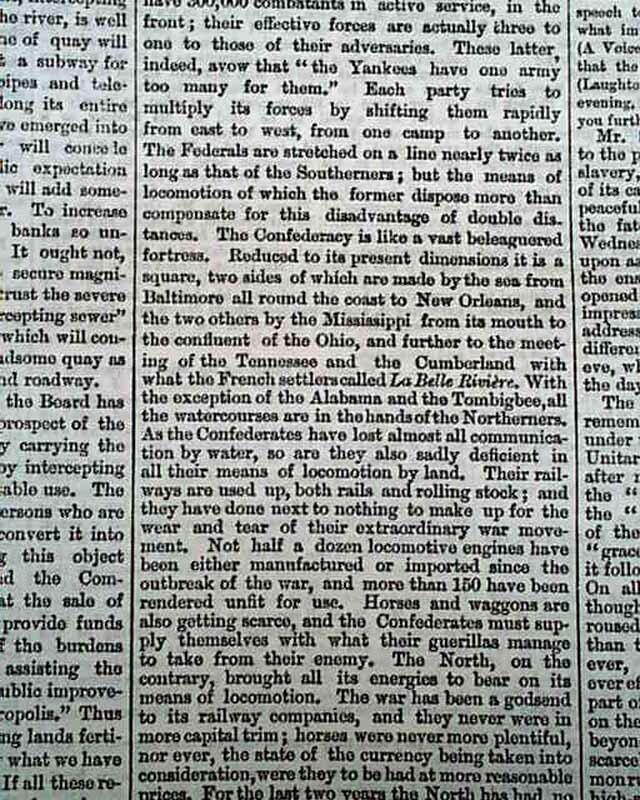 (see) The report continues with some account of the address by Edward Everett and Mr. Seward. 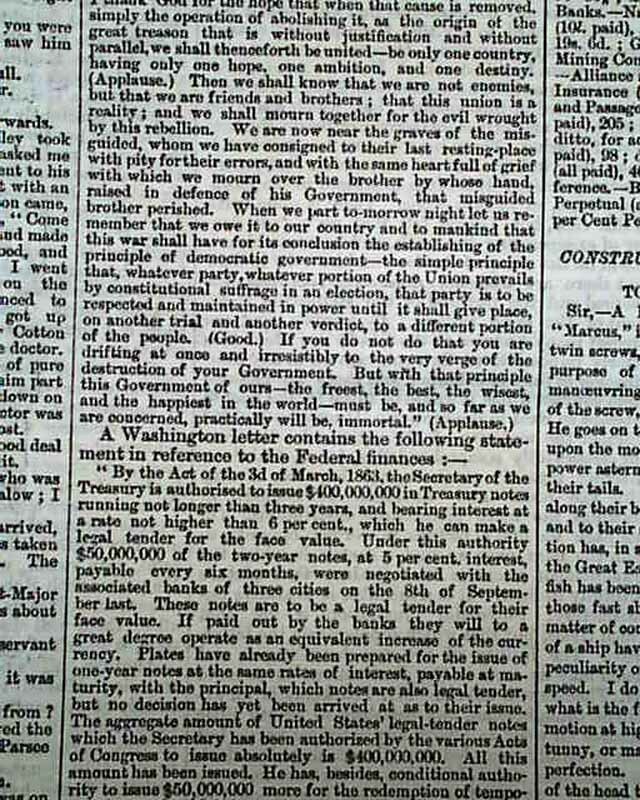 Of equal significance--or perhaps more significance as it is not to be found in any other newspaper--is the editorial commentary found on 3 pages later. 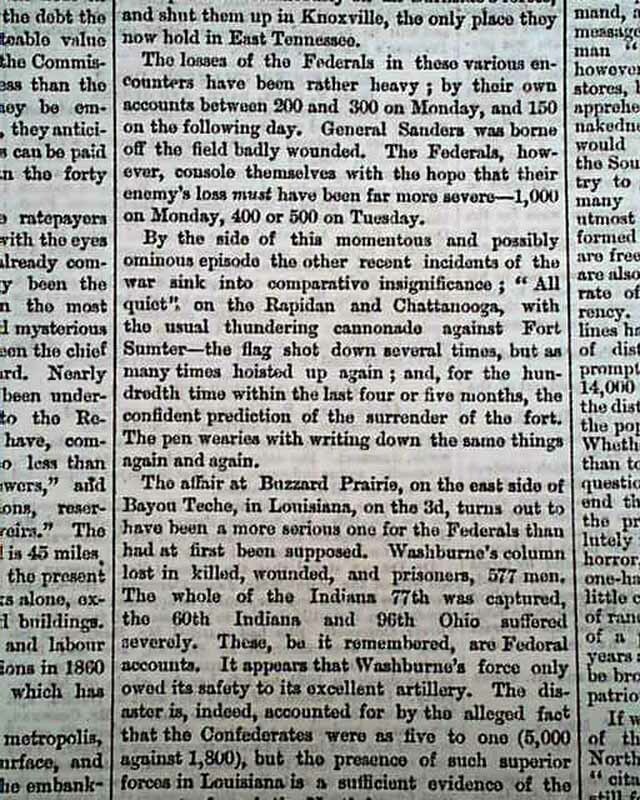 The entire commentary on the Civil War is headed: "The Civil War In America" and takes nearly 2 1/2 columns. 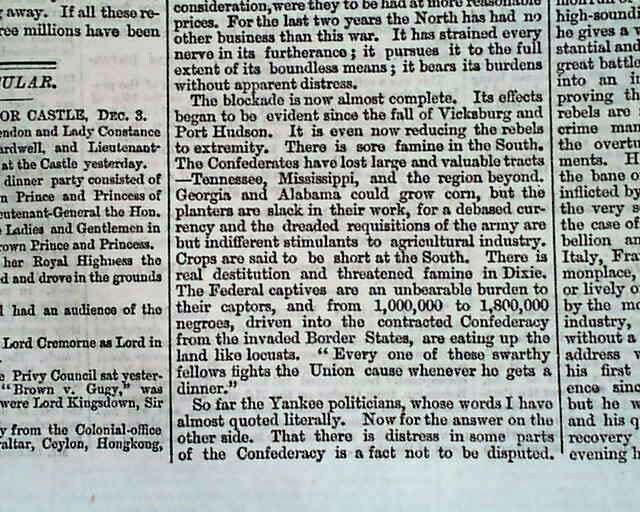 The 'Times' had an obvious bias in favor of the Confederacy (needed their cotton) and it is interesting to read the lengthy commentary from this perspective. 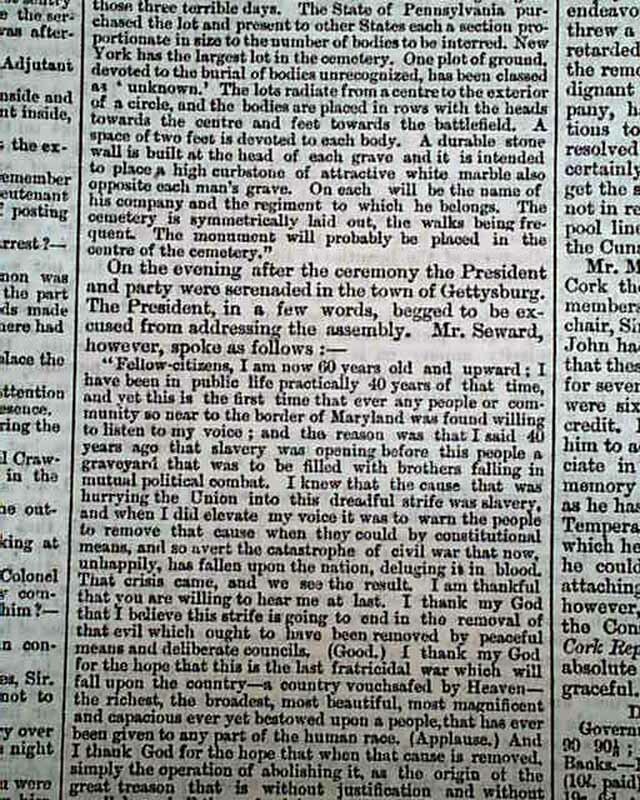 The notes on the Gettysburg Address are very interesting: "...The inauguration of the cemetery at Gettysburg was an imposing ceremony, only rendered somewhat flat by the nature of Mr. Everett's lecture, and ludicrous by some of the luckless sallies of that President Lincoln, who seems determined to play in this great American Union the part of the famous governor of the Isle of Barataria. 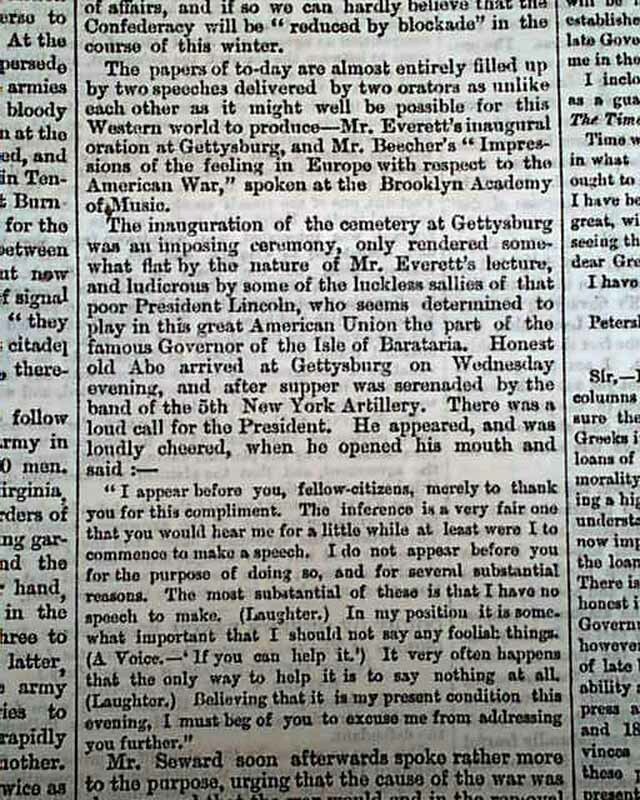 Honest old Abe arrived at Gettysburg on Wednesday evening & after supper was serenaded by the band of the 5th New York Artillery. There was a loud call for the President. He appeared and was loudly cheered, when he opened his mouth and said..." followed by the text of his extemporaneous speech (see). 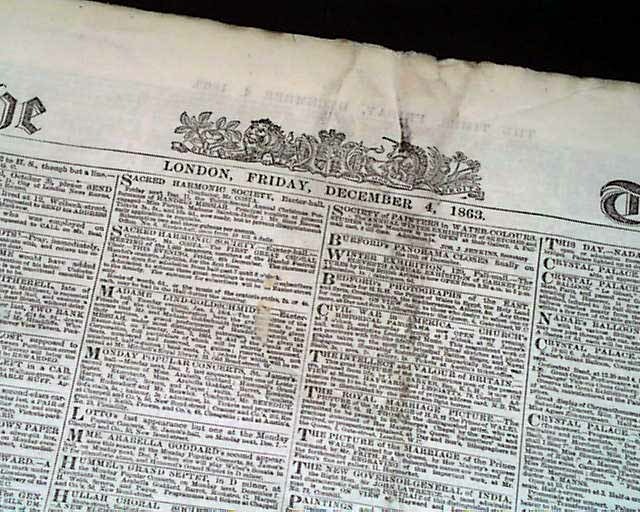 There is more including: "...The after-supper speeches of Wed. however were hardly to be looked upon as a prelude of the great sayings and doings of the ensuing day...opened by the Rev. 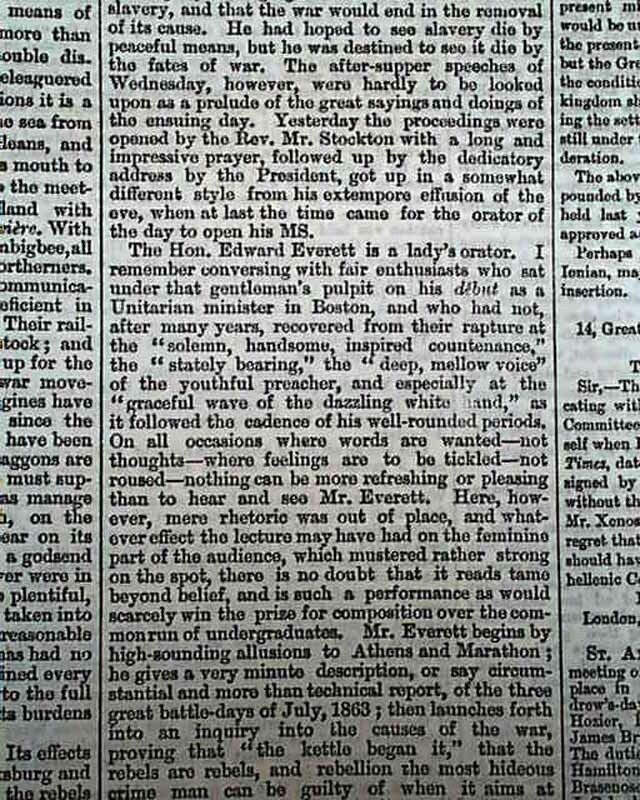 Mr. Stockton with a long...prayer, followed up by the dedicatory address by the President, got up in a somewhat different style from his extempore effusion of the eve..." with much more, most concerning Edward Everett's speech. Complete in 16 pages, never-trimmed margins, just a bit of dirtiness to the ftpg. only, generally in very nice, clean condition & printed on very sturdy paper.